, the most illustrious poet of modern Italy, whose true name was Trapassi, was born at Rome Jan. 6, 1698, the second son of Felice Trapassi of Assisi. Felice, though a free citizen of Assisi, was very poor, and settled at Rome in a small way of business. His son was very early distinguished for an extraordinary talent at speaking extemporary verses; and, at ten years old, used to attract a little audience in the street by the melody of his voice, and the sweetness of his unpremeditated poetry. 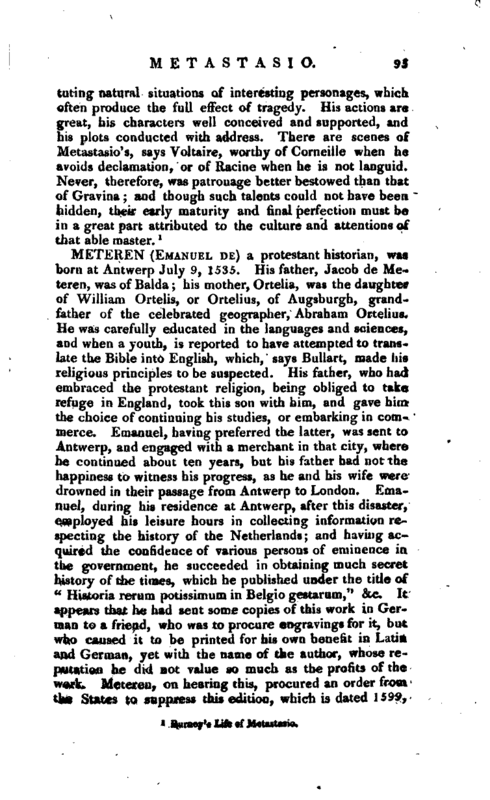 The celebrated Gravina, among others, accidentally heard him, and was so charmed with his talents, that, with the consent of his parents, he undertook to give him an education; and changed his name from Trapassi to Metastasio, a kind of Italianized Greek translation of the former name: and so much was he pleased with his disposition and talents, that he finally adopted him, and made him his heir. 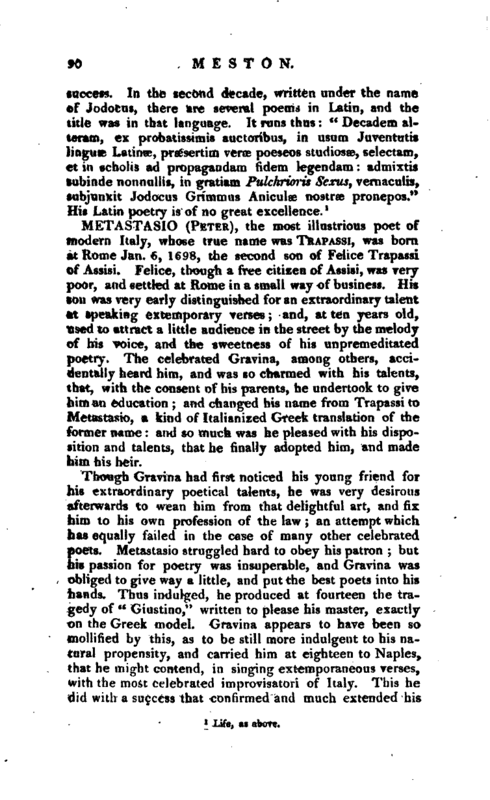 Though Gravina had first noticed his young friend for his extraordinary poetical talents, he was very desirous afterwards to wean him from that delightful art, and fix him to his own profession of the law an attempt which has equally failed in the case of many other celebrated poets. Metastasio struggled hard to obey his patron; but his passion for poetry was insuperable, and Gravina was obliged to give way a little, and put the best poets into his hands. Thus indulged, he produced at fourteen the tragedy of “Giustino,” written to please his master, exactly on the Greek model. 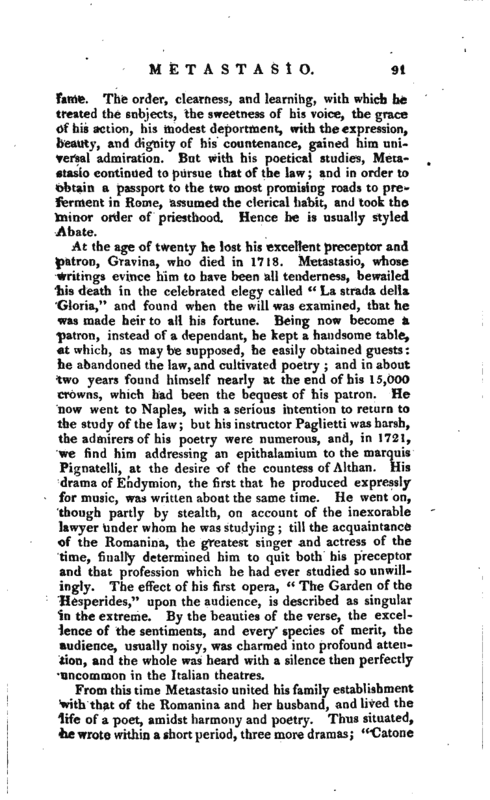 Gravina appears to have been so mollified by this, as to be still more indulgent to his natural propensity, and carried him at eighteen to Naples, that he might contend, in singing extemporaneous verses, with the most celebrated improvisator! of Italy. This he did with a success that confirmed and much extended his | fame. The order, clearness, and learning, with which he treated the subjects, the sweetness of his voice, the grace of his action, his modest deportment, with the expression, beauty, and dignity of his countenance, gained him universal admiration. But with his poetical studies, Metastasio continued to pursue that of die law; and in order to obtain a passport to the two most promising roads to preferment ia Rome, assumed the clerical habit, and took the minor order of priesthood. Hence he is usually styled Abate. At the age of twenty he lost his excellent preceptor and patron, Gravina, who died in 1718. Metastasio, whose writings evince him to have been all tenderness, bewailed his death in the celebrated elegy called “La strada della Gloria,” and found when the will was examined, that he was made heir to all his fortune. Being now become a patron, instead of a dependant, he kept a handsome table, at which, as may be supposed, he easily obtained guests he abandoned the law, and cultivated poetry and in about two years found himself nearly at the end of his 15,000 crowns, which had been the bequest of his patron. He now went to Naples, with a serious intention to return to the study of the law; but his instructor Paglietti was harsh, the admirers of his poetry were numerous, and, in 1721, we find him addressing an epithalamium to the marquis Pignatelli, at the desire of the countess of Althan. His drama of Endymion, the first that he produced expressly for music, was written about the same time. He went on, though partly by stealth, on account of the inexorable lawyer under whom he was studying; till the acquaintance of the Romanina, the greatest singer and actress of the time, finally determined him to quit both his preceptor and that profession which he had ever studied so unwillingly. The effect of his first opera, “The Garden of the Hesperides,” upon the audience, is described as singular in the extreme. By the beauties of the verse, the excellence of the sentiments, and every species of merit, the audience, usually noisy, was charmed into profound attention, and the whole was heard with a silence then perfectly uncommon in the Italian theatres. From this time Metastasio united his family establishment with that of the Romanina and her husband, and lived the life of a poet, amidst harmony and poetry. Thus situated, he wrotewithin a short period, three more dramas; “Catone | in Utica,” “Ezio,” and “Semiramide riconosciuta.” But it was now, in 1729, the thirty-second year of Metastasio’s life, that he was to change his country. A letter, dated Aug. 31, in that year, from prince Pio of Savoy, invited him to the court of the emperor, as coadjutor to signior Apostolo Zeno, in the office of imperial laureat. All matters of appointment being settled to his mind, he resolved, though with reluctance, to quit Italy, and his Italian connections, for this new country: and he actually arrived at Vienna in July 1730. From this time the life of Metastasio was uniform, even beyond what is usual to men of letters. He resided continually in one city, Vienna; and in one house, that of M. Martinetz: with the exception only of a visit in the autumn, which for a long time was annual, to the countess of Althan in Moravia, where he sought health from the bracing air of the mountains. To make the uniformity of his life more singular, he was naturally and habitually attached to an exact regularity, and passed one day precisely as he passed another, allotting particular hours for particular occupations. 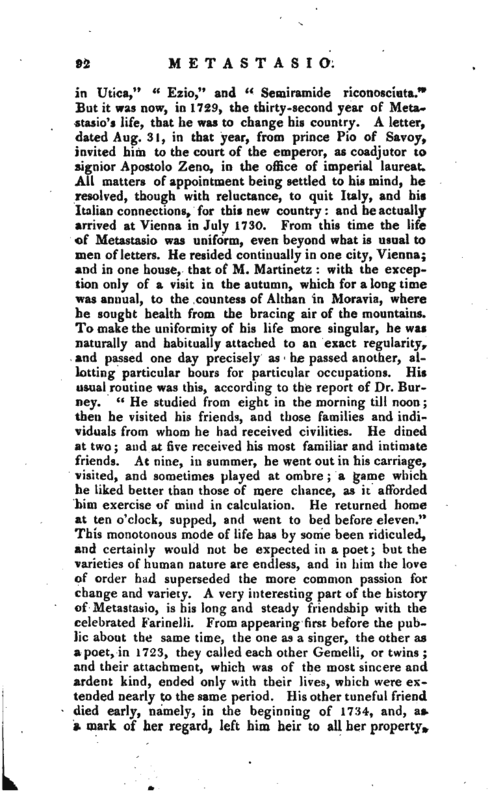 His usual routine was this, according to the report of Dr. Burney. “He studied from eight in the morning till noon; then he visited his friends, and those families and individuals from whom he had received civilities. He dined at two; and at five received his most familiar and intimate friends. At nine, in summer, he went out in his carnage, visited, and sometimes played at ombre; a game which he liked better than those of mere chance, as it afforded him exercise of mind in calculation. He returned home at ten o’clock, supped, and went to bed before eleven.” This monotonous mode of life has by some been ridiculed, and certainly would not be expected in a poet; but the varieties of human nature are endless, and in him the love of order had superseded the more common passion for change and variety. A very interesting part of the history of Metastasio, is his long and steady friendship with the celebrated Farinelli. From appearing first before the public about the same time, the one as a singer, the other as a poet, in 1723, they called each other Gemelli, or twins; and their attachment, which was of the most sincere and ardent kind, ended only with their lives, which were extended nearly to the same period. His other tuneful friend died early, namely, in the beginning of 1734, and, as a mark of her regard, left him heir to all her property, | after the death of her husband, to the amount of 25,000 crowns; but Metastasio, with his usual sense of propriety, and with great generosity, relinquished the whole bequest, and restored it to the disposal of her husband. 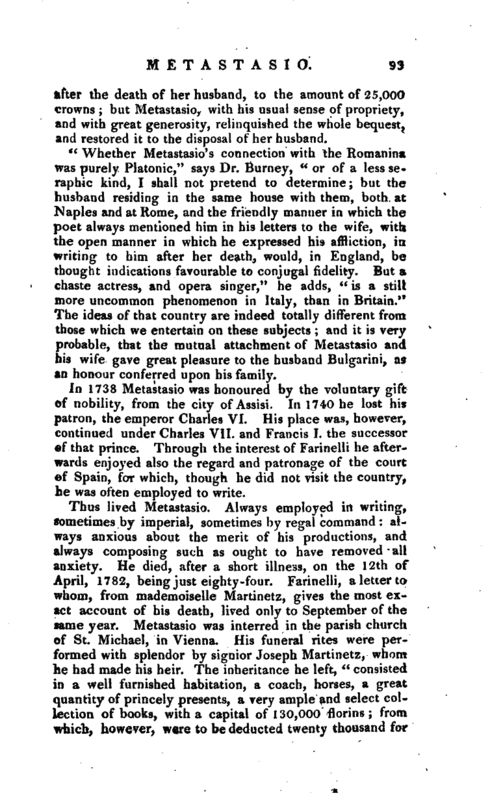 “Whether Metastasio’s connection with the Romanina was purely Platonic,” says Dr. Burney, “or of a less seraphic kind, I shall not pretend to determine; but the husband residing in the same house with them, both at Naples and at Rome, and the friendly manner in which the poet always mentioned him in his letters to the wife, with, the open manner in which he expressed his affliction, in writing to him after her death, would, in England, be thought indications favourable to conjugal fidelity. But a chaste actress, and opei^, singer,” he adds, “is a still more uncommon phenomenon in Italy, than in Britain.” The ideas of that country are indeed totally different from those which we entertain on these subjects; and it is very probable, that the mutual attachment of Metastasio and his wife gave great pleasure to the husband Bulgarini, as an honour conferred upon his family. In 1738 Metastasio was honoured by the voluntary gift of nobility, from the city of Assisi. In 1740 he lost his patron, the emperor Charles VI. His place was, however, continued under Charles VII. and Francis I. the successor of that prince. Through the interest of Farinelli he afterwards enjoyed also the regard and patronage of the court of Spain, for which, though he did not visit the country, he was often employed to write. 1 Burney’s Life of Metastasis.